It’s hard to be in China and not drink tea. Every train station, bus station and public building has a hot water machine for public use and it feels like 90% of Chinese people carry a thermos around with them every day. On some trains the conductors even provide a piping hot thermos of hot water to each cabin and refill it for the morning. It’s impossible to escape it so we caved and bought ourself a small thermos ($1.30) and some loose tea and joined the addiction. Drinking tea in China is an activity. You go to a tea house, which functions more like a public living room than a restaurant, and are presented with a long menu of tea. Usually this is in Chinese so we’re totally lost and just point to the cheapest one available. The glass, not a mug or teacup, arrives filled about ¼ with tea leaves and a large thermos of water is placed by the table. You simply fill the glass with the hot water, drink and repeat. 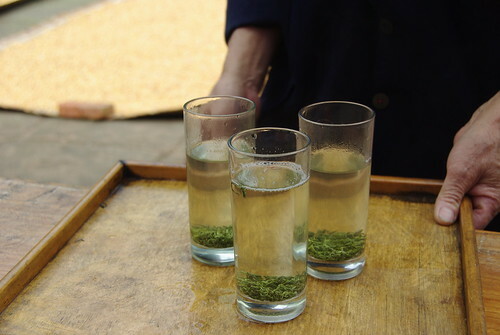 We sat at one tea house for five full hours in Chengdu drinking hot water from the same tea leaves. No one bothered us at all except to provide more hot water. Although that tea house was rather mundane, some tea houses provide snacks, card tables, mahjong sets, music and all sorts of entertainment. People come around the tables offering table-side massage and even ear cleaning. 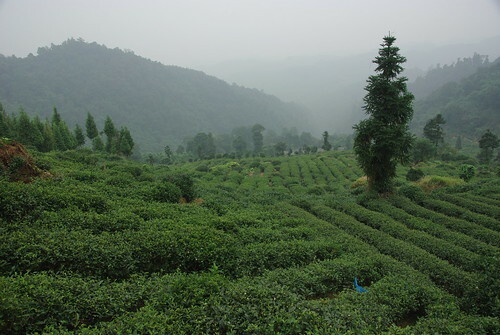 Tea growing is no small industry in China. Thousands of acres of tea plantations thrive across the country and the different varieties span the price bracket. It’s not unheard of for a nice tea to go for $10 a glass in Beijing. Some of the most expensive green tea’s come from the south of China and are believed to hold significant medicinal benefits. Puor tea, from southern China was so sought after in Tibet that the Chinese successfully traded the tea for horses. Tea is so ingrained in the culture that stores sell tea flavored snacks. I mistakenly picked up a pack of Oreos, labeled only in Chinese, that had a dish of ice cream on the front. Green with a sprig of leaf on the side, the picture looked to me like mint. Excited I thought I had found mint Oreos, but after the first bite it was clear that either they had gone bad or it wasn’t mint. After a few bites (or one: the number of bites Danny needs to consume the creamy half of an oreo) the flavor finally dawned on us– they were tea flavored. Needless to say we didn’t buy those again! The world is a small place, even on the road, and it’s not unusual for us to run into people again on this journey. Usually it is within the same country, but in Chengdu we were fortunate enough to run into our couchsurfing hosts from Buenos Aires. Of course it wasn’t exactly serendipity (no frozen hot chocolate either), but it was a welcome break to see a familiar face. You never know when people are going to walk back into your life and sitting in the hostel one evening another surprise- in walked in an expat couple we had met in Xinjiang province. Small worlds collide in Chengdu and for a few days it felt like we were back at home hanging out with friends. Needless to say we spent a few extra days in Chengdu soaking it all in. Thankfully there was a lot to do in and around Chengdu and we treated ourselves to a few special travel treats. Heading out to the country side we spent a day near Ping-Li, an old feeling village about 2.5 hrs from Chengdu. The town was touristy and although we spent a lovely afternoon being poled up and down the river on a reed boat drinking green tea and chatting away, the best part of the excursion was hiking through a tea plantation. Upon our arrival at the tea plantation we weren’t sure what was going on. We were served tea, but it became clear we had interrupted some sort of meeting. As time went on we became convinced we were part of a local communist party meeting, which may be in truth unlikely, but it still makes for a fun story. Exploring the tea plantation and the bamboo forests surrounding it was peaceful and completely different than the chaos and hassle of big-city China. 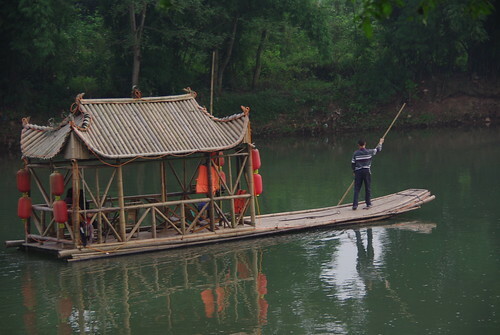 It was a relaxing way to spend a few hours and frankly one of the best things we did in Chengdu. 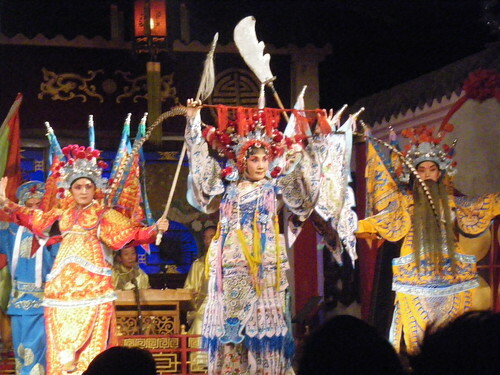 The other treat was the Chengdu Opera. Opera isn’t really the right word for the show we saw, it was more like a variety show, and although clearly for [mostly Chinese] tourists, it was very entertaining. From shadow puppets, to marionettes, to true operatic performances and violin-like solo’s, the show was lively and for the first time in a long time we had a taste of the local professional performing arts. Perhaps the most interesting part of the show was the up-close show by the tea-pourers. Holding the tea in large brass tea pots with spouts well over a meter long, the tea-pourers seemed to be able to shoot the tea out of the spout into your cup several inches away. It was an incredible presentation and not once did our pourer spill, even across four people! 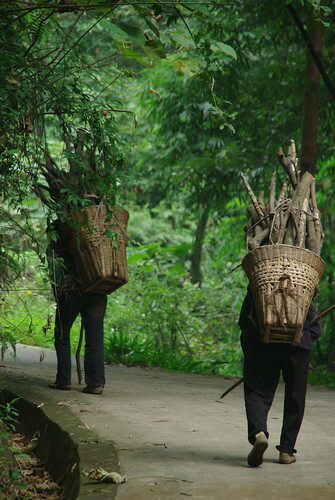 IF YOU GO: Try to combine a tour of Ping-Li with a tea plantation. We hired our own taxi for the day through our guesthouse. Ping-Li is very touristy, but we enjoyed wandering around after dark. Trips to the Chengdu Opera shows can be arranged inexpensively through lodgings, and often freebies- such as a VIP upgrade (which basically just means unlimited green tea) transportation and a tchochky are included. We stayed at Sim’s Cozy Garden, after first staying at another less nice place….we recommend you do the same.